Home Promos samsung The Great Samsung Blue Sale Get up to PHP 5,000 off on phones at The Great Samsung Blue Sale! Get up to PHP 5,000 off on phones at The Great Samsung Blue Sale! Gaming, movies, and music level up with the Galaxy J6. Its Super AMOLED Infinity Display provides incredible color clarity while Dolby Atmos grants immersive cinema-like sound once the earphones are plugged in. The device is also powered by a 14nm Octacore processor, ensuring that high-resolution games and videos run lag-free. The Galaxy J6 is now only PHP 9,990, down from its original PHP 13,990 launch price. The Galaxy A6 and A6+ are sleek, stylish, and packed with superb image-capturing features. The A6+ comes with a 24MP front camera and a 16MP + 5MP Professional Dual back camera. The A6, meanwhile, features a 16MP resolution for both front and back cameras. Both devices also come with adjustable LED and selfie flash, granting a great reel of images, no matter the lighting condition. The Galaxy A6 is now available at PHP 11,990 while the Galaxy A6+ is now at PHP 17,990, down from the original prices of PHP 14,990 and PHP 22,990, respectively. From bingeing the latest movies and shows to conquering new worlds, the Galaxy J7 Core and J2 Pro are perfect for your quick entertainment getaways in the middle of a busy day. These phones pack a punch—powerful gaming and a rich canvas of on-screen colors on a budget. The Galaxy J7 Core is now priced at PHP 8,990, while the J2 Pro is available at PHP 6,990. Apart from big discounts, Samsung is also offering exciting promo bundles. Buy a Galaxy Note9 from September 7 to 16 and receive a free Galaxy Tab A 7.0. A Galaxy J7 Core or J2 Pro bought from September 8 to 30 comes with a free Eider phone. Lastly, customers can get a PHP 1,500 voucher for every Galaxy J8 and Galaxy A6 purchased from September 1 to 30. 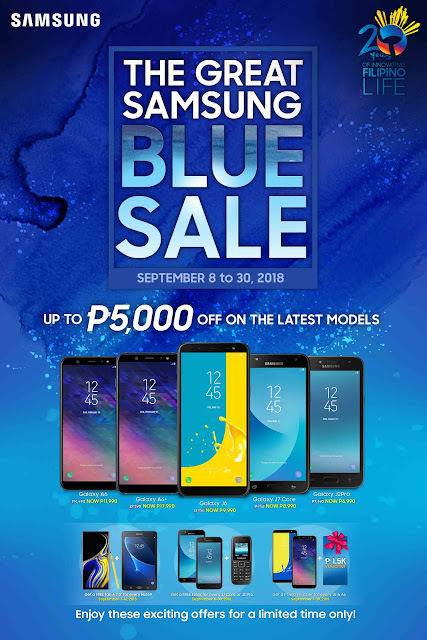 The Great Samsung Blue Sale is ongoing now and will run until September 30, 2018 at all major electronics outlets. To know more, visit any Samsung-authorized store nationwide or visit facebook.com/SamsungPH or samsung.com/ph.